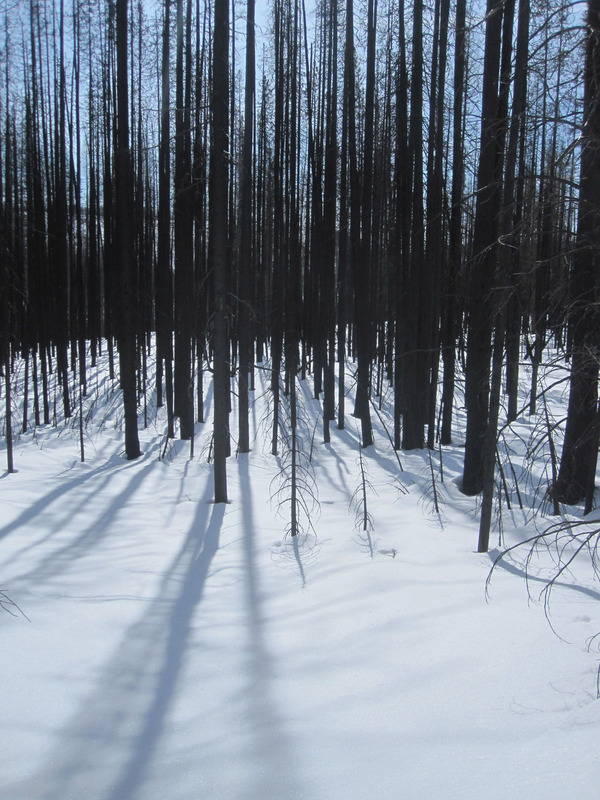 John and I snowmobiled to Haney Meadow and passed through the forest that burned in 2012. On the way, my eyes sought familiar landmarks in this changed place–a particular larch tree towering over a road junction that didn’t burn in the fire. I felt grateful to see it still standing. The meadows are blanketed with pure white snow that reflected the bright spring sun in our faces. The hillside sweeps up to basalt rimrock and the blackened forest stands silhouetted against the blue sky. It’s mostly a landscape in black and white and I thought of drawing the straight shapes with charcoal on clean paper. Big drawings to capture the powerful verticals of the trunks and the blue diagonals of shadows. I saw that the scorched bark on the lodgepole pines is beginning to peel away, revealing yellowish wood. As the bark disappears, the wood will bleach to silver-gray and remain standing. One by one, decay will bring the snags down as young lodgepole pines germinate and reach for the sky. Overhead, pairs of ravens courted, swooping and looking down at us with turned heads. The burned forest is a reminder of cataclysm; drastic change that was upon us before we could fully comprehend what was happening. It’s also a reminder of renewal and fresh starts. The snow is like a sheet of fresh drawing paper, waiting and full of potential. The first marks were lightly drawn even as the fire still smoked. As the snow melts, the charcoal sketch will be revealed as life swells and grows. Right now, the contrast is stark but as the drawing develops the edges will soften and some of the transitions between shapes will smooth out. The visual world, as well as the living world–is an exploration of time and space. Probably better to not think about it too much, rather experience it first hand. Time to draw!